If you want to get started playing online casino poker, this is the first article you need to study carefully. Here we’ll provide a quick reference guide to poker hand rankings, which as you should know are the cornerstone of this game. You can’t play poker unless you’re familiar with the poker hand rankings, and you can’t become a player to be reckoned with until you know all of these by heart. So make sure to read this carefully as you begin your golden road to Poker. 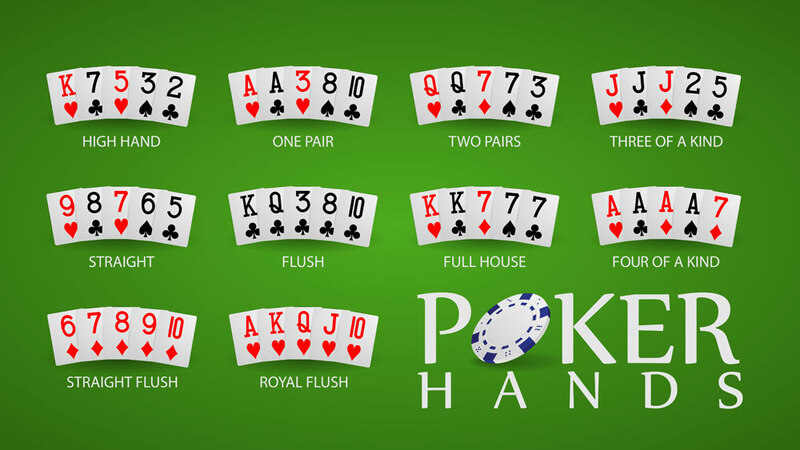 If you’re a beginner in the world of poker, you’ll naturally have to pace yourself as you learn the poker hands. At first you’ll just have to memorize them, but as you build game experience you’ll find you can analyze hands very quickly. You need to keep practicing until you get to the point where you can check hands at a glance and begin to develop a feeling for the winning probability of any combination of cards. That’s when playing poker gets really interesting, and it’s also when you’ll find yourself winning consistently. So proceed confidently and learn poker hands by heart, starting right now! Royal Flush: this is the most powerful hand you can hope to get in any poker game, period. A Royal Flush means you have all the highest cards in the same suit, which in most poker games gives you absolute guarantee of stealing the pot since it’s statistically impossible for two different suited Royal Flushes to be assembled in a single game of poker. You won’t often get this perfect hand, but when you do make sure to play wisely and get the most of it. Straight Flush: next in line, the second best hand you can get in a game of poker is a Straight Flush. As the name implies, this is a sequence of five suited and ordered cards. While getting this hand gives you high chances of winning, you should look at the community cards carefully to determine the odds of another player having an even higher Straight Flush. The highest possible Straight Flush is of course the aforementioned Royal Flush. Four of a Kind : a set of all the four suits for a same card. The strongest Four of a Kind you can get is AAAA, then KKKK and so forth until 2222, which is still a notably strong hand that can only be beat by a Royal Flush or Straight Flush, assuming the community cards make it impossible for another player to also have Four of a Kind. Full House: this is basically when your hand combines a single pairing of cards plus three of a kind, the strongest possible combination being three Aces and two Kings. Flush: a set of five cards of the same suit, with random cards as opposed to an ordered sequence (in which case it would be a Straight Flush or a Royal Flush). Straight: a simple sequence of five cards of different suits, although with numerical order. Three of a Kind: when you have three cards of the same suit, which is also referred to as a set. Two Pair: when you have two different pairs of cards, such as AA KK (the highest possible two pair). One Pair: a single pair of cards, the highest possible combination being of course AA. High Card: when no player happens to get any of the nine winning hands listed above, the player holding the highest card will take the pot. Have you learned the above combinations by heart? Now you’re ready to play poker online! Just remember that knowing the poker hand rankings back and forth is just the beginning of your journey. As you advance in the game and grow as a player, you’ll find that checking for winning hands at a glance becomes second nature… and that’s where the real fun begins. Learning poker is very easy, but mastering the game is very challenging. In practical terms there is much to keep track of, and you you will often miscalculate the winning odds of your hand and underestimate the possible hands other players can put together. To advance in the game you need to look beyond your own hand, and keep tracking the odds of other players having a higher hand, which is only possible if you stay focused on the community cards as well as closely reading other players. Doing all this can be daunting at first, but it’s well worth the effort. If you stick with it and nurture a love for the game, every new hand will be an opportunity for learning and growing. Next Post Are poker coaches all they are cracked up to be?